원효대사가 주지로 있었던 고선사의 옛 터에 세워져 있던 탑으로, 덕동댐 건설로 인해 절터가 물에 잠기게 되자 지금의 자리인 국립경주박물관으로 옮겨 세워 놓았다. 탑은 2단의 기단(基壇) 위에 3층의 탑신(塔身)을 쌓아 놓은 모습인데, 통일신라시대 석탑양식의 전형적인 형태이다. 기단은 여러 개의 돌로 구성하였으며, 각 면에는 기둥 모양을 새겨 놓았다. 탑신도 여러 개의 돌이 조립식으로 짜 맞추어져있으나, 3층 몸돌만은 하나의 돌로 이루어져 있다. 이는 사리장치를 넣어둘 공간을 마련하기 위한 배려로, 석탑을 해체·복원하면서 밝혀졌다. 지붕돌은 윗면에 완만한 경사가 흐르는데, 아래로 미끄러지는 네 귀퉁이가 들려있어 경쾌함을 더해주고 있다. 밑면에는 계단 모양으로 5단의 받침을 새겨 놓았다. 통일신라시대 전기인 7세기 후반에 세워졌을 것으로 추측되며, 전형적인 석탑양식으로 옮겨지는 초기과정을 잘 보여주고 있다. 이러한 양식은 이 탑과 함께 경주 감은사지 동ㆍ서 삼층석탑(국보 제112호)에서 시작되어 이후 경주 불국사 삼층석탑(국보 제21호)에서 그 절정을 이루게 된다. 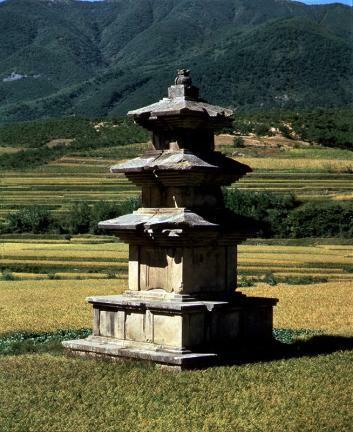 This pagoda was discovered at the former site of Goseonsa Temple where Wonhyo, one of the greatest Buddhist monks, served as head monk. It was moved to its present location at the Gyeongju National Museum in 1975, as the area occupied by the Goseonsa Temple Site had to be flooded with water for the construction of Deokdong Dam. 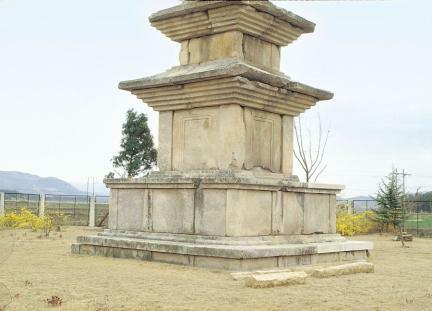 The pagoda consists of a three-story body mounted on a two-story platform - the prevalent style of the Unified Silla Period. 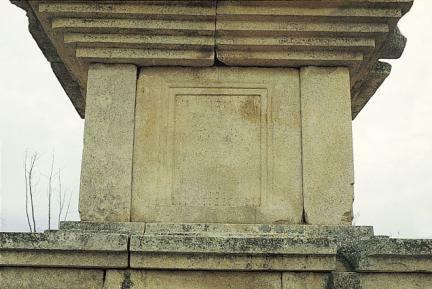 The platform is made of several stones, and each of its sides is adorned with pillar-shaped carvings. The body is also made of several stones, although the third story of the main body is made of a single stone. Perhaps this was for making the space for the reliquaries that were found during the dismantling the stone pagoda prior to its reconstruction. The roof stone slopes gently toward the four corners, which are slightly raised, give the pagoda an appearance of lightness. The staircase-shaped support of the roof stone is made of five layers. 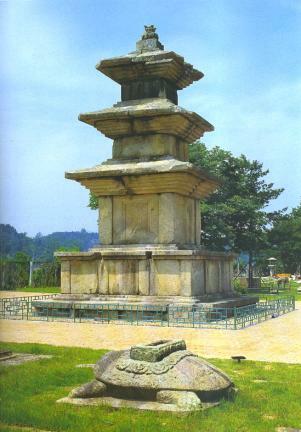 The pagoda is presumed to have been built in the late 7th century, before the completion of typical styles in the stone pagodas of Unified Silla. 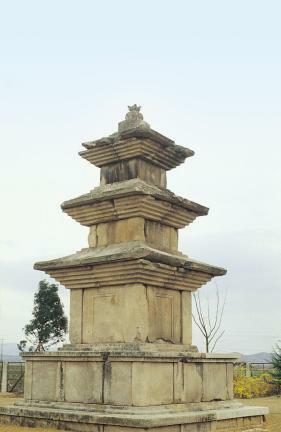 This typical style can be also seen in the East and West Three-story Stone Pagodas at Gameunsa Temple Site (National Treasure No. 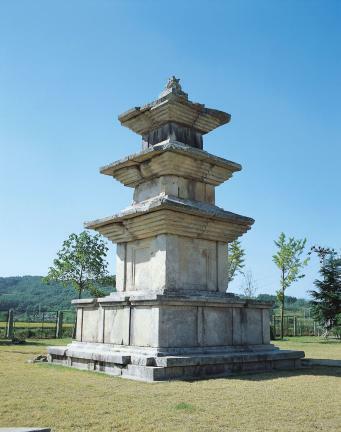 112), and reached its artistic peak with the Three-story Stone Pagoda of Bulguksa Temple (National Treasure No. 21).